What is a piecewise defined function? The linear and quadratic functions we have introduced so far use a single rule to define the function. For a piecewise defined function, the function is defined by several rules. Each rule corresponds to a different piece of the function. appears to be a function that is defined by a single rule. 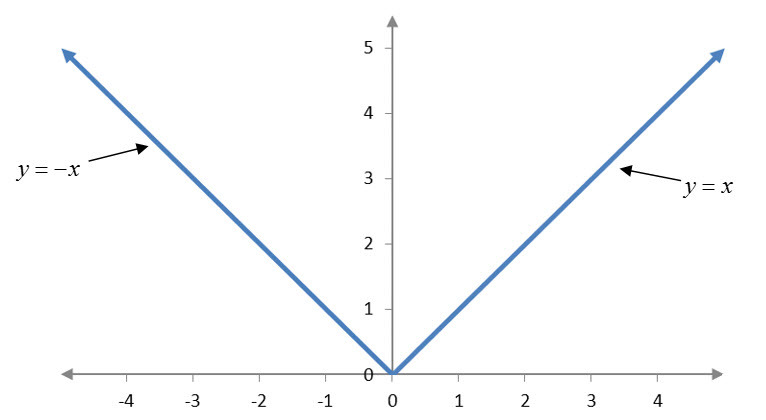 However, if we look at the graph of the absolute value function, you see two different lines in the shape of a “v”. Figure 4 – The absolute value function. A piecewise function may have any number of pieces and may or may not be defined for every possible input. If there is no piece of the function defined for an input, we simply say the output is undefined. where x is the amount of medical charges incurred at the point of treatment. a. Find the total annual cost for $5000 in medical charges. The total annual cost corresponding to $5000 in charges is $3392. b. Find the total annual cost for $30,000 in medical charges. A person incurring $30,000 in medical charges would have a total annual cost of $12,552. In fact, for any amount of medical charges above $27,900. the total annual charge is $12,552. This is due to the fact that the plan has reached its out of pocket maximum at this level of charges. c. Find the total annual cost for $250 in medical charges. Solution No part of the function corresponds to so the output is undefined. The domain of the function is and this input lies outside of this interval.